You are currently browsing the tag archive for the ‘horse treats’ tag. Guess which way the wind is blowing. Hanging out with horses has many rewards. Loyalty, companionship, friendship, and connection to nature all come to mind. And then there are the personal growth benefits. Things like confidence, strength, and empowerment. But there is also a benefit that is not often mentioned. It’s smaller in the grand scheme of things, but important nonetheless. Knowing which way the wind is blowing. Horses are living, breathing weather vanes. In the wind, horses know exactly what to do. They stand with their butts to the wind. The only exception I’ve seen to this is our Herd of Oldsters, who will brave all elements for treats. 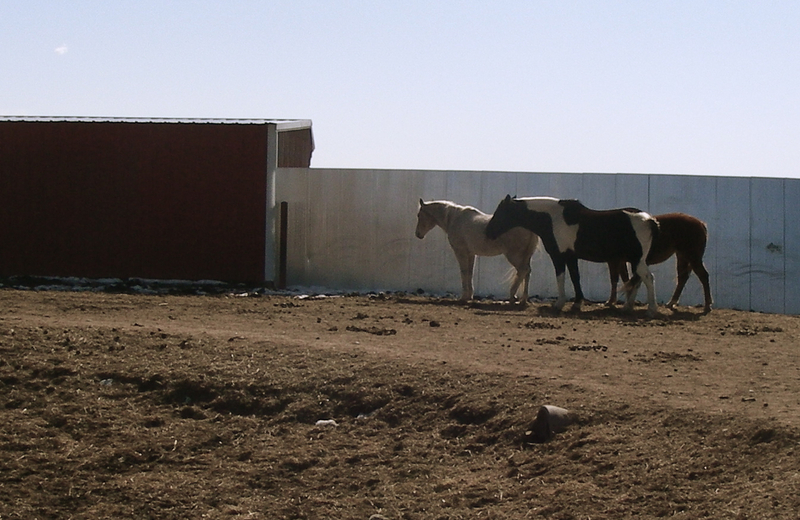 They’re willing to stand facing into the wind, if a horse cookie or hay cube is in it for them. But normally, butts to the wind, as so aptly demonstrated by these three characters in the photo. Drive past a group of horses and you will know immediately which way the wind is blowing without ever having to exit your vehicle. I’m not sure how it’s totally relevant to our urban lifestyles, but you never know when this information could come in handy. I do aim to be a full-service blogger! Bud absolutely loves this little treat. I mean to say he adores, is crazy about, goes gaga over horse candy. Like good parents, we insist that he finish his grain before he gets to eat candy. Since he’s a food gobbler, as described in an earlier post, he can dispatch his pan of grain in short order. That’s when he starts nosing around the candy bucket. On many occasions, he’s been able to use those prehensile lips to open the lid, if I’m not paying close enough attention. The candy goes flying to the ground and Bud does his best imitation of innocence. “Oops.” The look on his face tells me he’s as surprised as I am. He noses around and then, never one to pass up a snack, he plucks one or two or twenty from the dirt. Life doesn’t get much better than this. In his younger years, feeding treats to Bud was like plugging a parking meter with dimes. You just kept on feeding the meter, one after the other. He did a bang up imitation of a squirrel, with his cheeks packed with candy. These days, he’s slowed down a bit because of his teeth. He’s missing a couple on the bottom, which make chewing more difficult. Translation: there’s a LOT of spillage. But spillage or no, we have a routine, and as far as Bud is concerned, the routine is everything. First grain, and then horse candy. Never deviate from the plan. If you’re wondering about Pepper, she also loves horse candy. A little grain and filler, nutrients and sweetness. Sugar and molasses are what make her tail fly up. 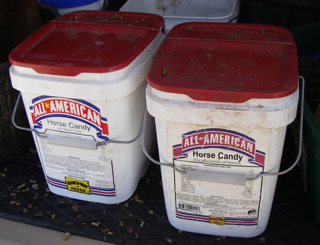 Most horses have a real sweet tooth and ours are no exception. And by the way, I’m not promoting this product. Ranch-way feeds doesn’t even know I exist. I’m just tellin’ you what my horses like. 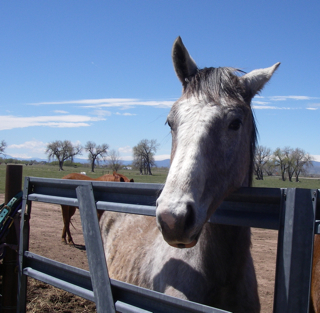 New horse in the pasture. 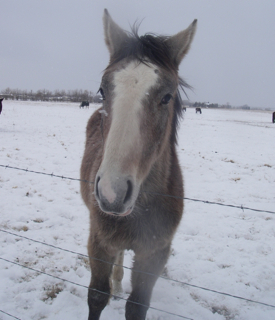 I first met the newest member of the pasture sometime in late February. She was young and seemed frantic to find her place in the herd. Herd politics were in full swing and this little filly was being run around the pasture until she was worn out. She’d sidle up to one group, only to be chased away. Then she’d try another group with the same result. It reminded me of the classic children’s book, Are You My Mother? In this book a baby bird can’t find his mother and approaches the cow, the horse, the frog, the cat etc. with the title question. He was trying to find where he belonged, just as this little filly was. I know it’s part of learning to be a horse, but it was hard to watch. My mothering instincts were clanging like a church bell. We didn’t know her name, so we dubbed her Baby, though lately Rick has taken to calling her Nicoletta Nickerbean. The reason will soon become clear. Turns out she’s a yearling. Only one year on the planet. She seemed young to be put in the pasture to fend for herself, especially since it was winter and everyone was into power struggles over the hay. 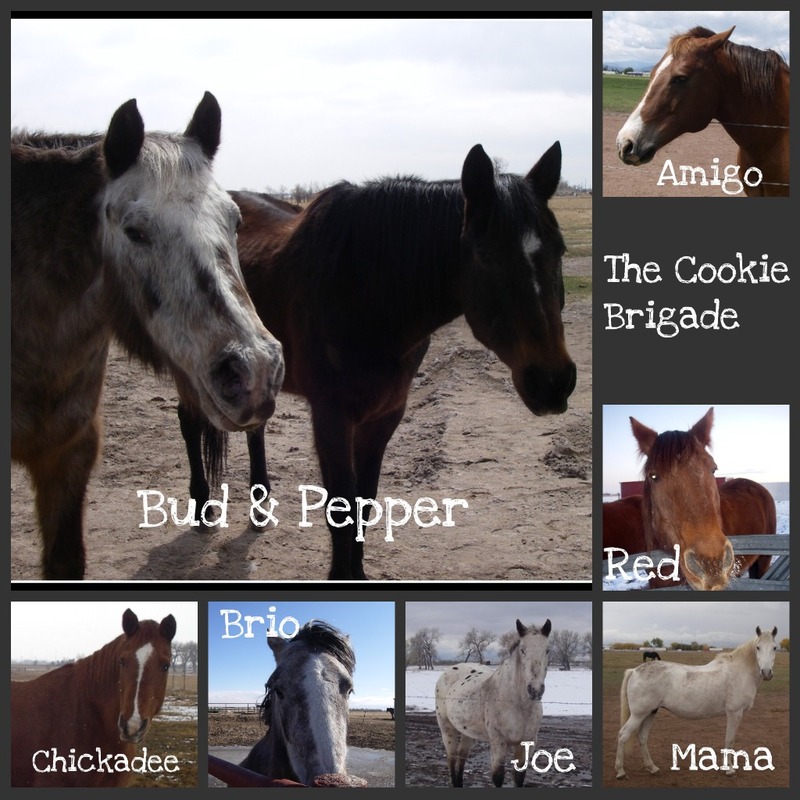 After being chased for a day or so, Baby found the geriatric herd – that would be the one comprised of Bud, Pepper, Red, Amigo, Macie and Hanger. Not everyone here qualifies as geriatric, but they seem quite content to live in this little band. Most of the time, it’s a kinder, gentler place to hang out. Maybe they’re the pacifists of the pasture. Baby seems to fit in nicely. She’s the first yearling I’ve had the privilege to know, and I really love the experience – and her. Baby is a blank sheet of paper. Everything is new and she reacts with curiosity and enthusiasm, with ears alert, and face open. She’s full of energy and a bit gangly, which makes her all the more adorable. While my two old sweeties eat their grain, I dispense treats to the rest of the geriatric herd, usually lined up along the fence waiting. This has become part of the daily routine for them and me. A nicker is a vibrating, throaty sound that a horse makes with her mouth closed. It is usually a greeting. It is one of the sweetest sounds I’ve heard. Baby seems to know that when she nickers at me, she gets another treat. Like I said, I’m a sucker for nickering. It’s a form of behavior modification. She nickers and I reward her with a treat. The only thing I don’t know for sure is who is modifying whose behavior? In truth, she’s trained me well! Here’s how it goes: She sees me, runs toward me with that adorable throaty sound that ends with an upward inflection – kind of a little squeal. And I turn into a puddle of goo, and dig out another treat. My justification is simple. A fifty-pound bag of treats costs less than two glasses of wine at a restaurant. Between you and me, doling out the treats is often more pleasurable and I don’t end up with that red-wine-headache the next day.